The British Museum Stolen Goods Tour Returns on May 4th! – BP or not BP? The Indigenous Australian campaigner Rodney Kelly is coming back to the UK – and we’ll be joining him once again in the British Museum to call for the return of his ancestral shield and an end to BP sponsorship. Back in December, Rodney was joined by speakers from other communities with stolen artefacts in the museum, for a completely unofficial “Stolen Goods Tour” that made the links between colonialism, stolen culture, and oil sponsorship. The tour was hugely popular, with hundreds of people cramming into the museum’s galleries, and on Saturday May 4th we’re doing it again! The British Museum Stolen Goods Tour Returns! Join Indigenous Australian campaigner Rodney Kelly and other (to-be-announced) speakers for the second completely unofficial free tour of the British Museum’s stolen goods and its controversial oil sponsor. Read a report from the last tour here and watch the film here. The British Museum is coming under increasing pressure from repatriation campaigns around the world to return vital cultural items, including the Rapa Nui’s Moai Head, the Parthenon Marbles, and the Rosetta Stone. Many communities with stolen items in the museum are also on the frontline of the pollution, human rights abuses, and climate breakdown caused by the museum’s sponsor, BP. Come and hear speakers from affected communities including Rodney Kelly, who has a direct claim to one of the museum’s most notoriously stolen items, the Gweagal Shield. In 1770, the shield was carried by Rodney’s 6th generation direct descendant, Cooman, when James Cook landed at Kamay (also known as Botany Bay). Visible on the shield is a bullet hole from where Cook and his men opened fire on the local people. A bullet went straight through the shield and wounded Cooman in his leg, forcing him and the others to flee. The shield, along with other items, were stolen by Cook and his men, and were ultimately given to the British Museum. The bullet hole in the shield tells the story of the first contact between the British and Indigenous Australian people – a story of immense colonial violence, and therefore carries immense significance for the Gweagal people and for Indigenous Australia as a whole. Rodney has been campaigning for the return of the shield – despite attempts by the British Museum to dispute his claim. 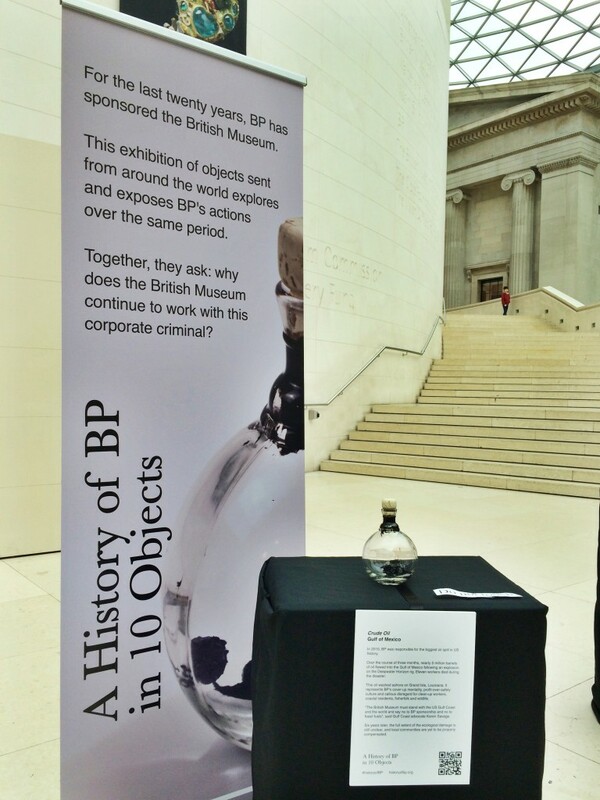 The British Museum currently has a five-year sponsorship deal with BP. In 2015, the museum placed the Gweagal Shield and other Indigenous Australian artefacts in a BP-sponsored exhibition. Rodney Kelly has been outspoken in challenging this. In 2018/19, the museum placed a BP logo on an Assyria exhibition featuring looted items from modern-day Iraq – sparking outrage from Iraqi campaigners who were horrified to see part of their history being used to promote a company complicit in the brutal 2003 invasion. JOIN US to hear the extraordinary true story behind the Gweagal Shield and other colonially-seized items in the museum – stories that are too often missing from the museum’s official labels and displays. Rodney Kelly speaking at the December 2018 Stolen Goods Tour. Photo by Diana More. Read Rodney Kelly’s powerful statement here. See the film of the February 2019 mass museum takeover to challenge the BP-sponsored Assyria exhibition in English here and in Arabic here. This year, for the first time, the museum has agreed to let Rodney Kelly view the shield out of its case. Join the tour to learn more, and help keep up the pressure so that the Gweagal Shield – and other stolen items from around the world – can finally go home.